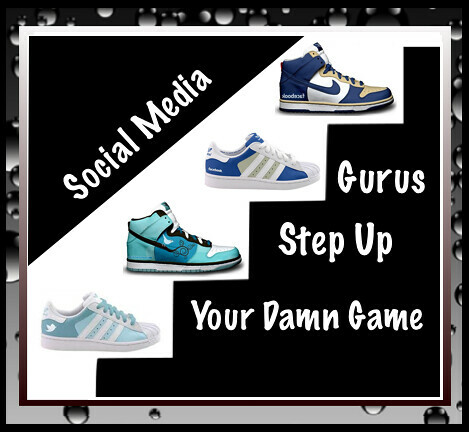 Step Up Your Game Gurus: ARE You Rocking The World Of #SocialMedia Clients or NOT? Social media is indeed a phenomenon and I am enjoying the ride. The past two years have been amazing in regard to the astounding growth of this technology. Social Media has literally turned the world upside down and changed everything as we know it. There are so many people that have jumped on the Social Media Bandwagon and as a lover of this new and exciting technology I can totally understand that! It is an exciting time to be involved with this history making era in technology growth. Because this technology is so new and people are still learning there’s a lot of room for growth for everyone in this industry. If you are using social media in a recreational way, there is all the time in the world to wrap your head around the super quick growth of this industry. Do you hear a “but” coming on, well here it it. BUT, ( I know I’m not suppose to start a sentence with but, so what, I’m doing it anyway 🙂 if you are presenting yourself as a social media expert and you are taking on clients as such you MUST BE ON YOUR A GAME. If not you will be labeled a GURU and that is not a compliment. As a Social Media professional we owe it to our clients to represent this industry in a positive manner, which means you should be on your A Game at all times. NO EXCEPTIONS! Real A Game Social Media Experts are working hard to present this industry in a favorable light and working harder to convey the importance of Social Media to those that are slower to adapt to this newer industry to market their business. The half stepping, self appointed gurus that are NOT on their A game make it that much harder for people that ARE A Gamers in this Industry to present social media as a real opportunity for businesses to market their company. It is imperative that if there are areas that you are lacking skill you make it your business to educate yourself especially if you are marketing your services as a social media expert. I’m not saying that I know it all because I do not, however I never present myself as one to know everything about all aspects of social. If there is information I lack, I am quick to admit it and or educate myself accordingly. Social Media as we know it is relatively new especially in regard to business marketing so it is very easy to NOT know everything. However it is YOUR JOB as a Social Media Expert selling your services to companies, to step your damn game up. Poop or Get off the pot! Step it up Gurus!